While spray paint can be relatively easy and inexpensive to remove, etched or acid etched graffiti is very costly or impossible to remediate. Our films act as a sacrificial layer to reduce the high cost and operating time that comes with replacing glass, metal or stone. 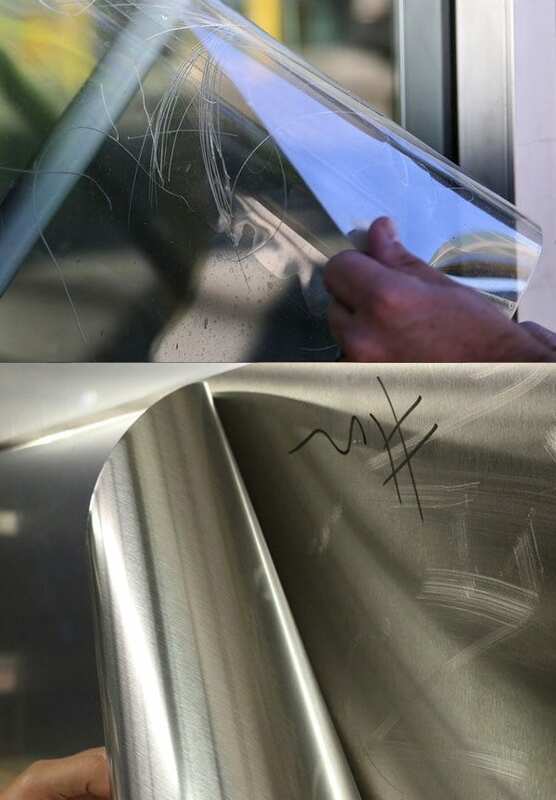 Our anti-graffiti films can be installed as a single layer and be reinstalled after each tagging, or have as many as 6 layers, allowing us to remove one layer each event at very little cost. In addition to our clear films, we can replicate the look of stainless steel, brushed aluminum, mirrors, or even wood. Water, cleaning products, and normal wear over time can cause smooth surfaces to look less than their best. At a fraction of the cost to replace these finishes, we can match and cover existing surfaces. Our custom printing service allows us to add any image or message to your projects. Turn mirrors and bathroom stalls into ad space or convey important information to customers or employees. Change the look of existing finishes with in stock or custom designs. Add color and personality while covering damage and protecting from future wear and tear. You can update frequently and still save money over full replacement.